Look no further. rusailing is a fully recognised RYA training centre offering a refreshingly personal and professional approach to all your sail training needs. Learn to sail with the best. We have now completed 13 years of operation and are proud to be the longest standing RYA sailing school in Portugal. We pride ourselves in providing excellent and realistic tidal training from our base in Marina de Lagos on the beautiful Algarve, Portugal – the jewel in the crown of the entire coast. 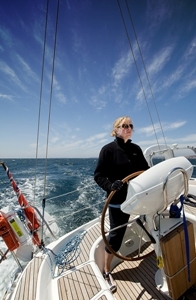 We offer the entire range of RYA courses connected with sail training. From theory to practical with all the one-day courses available to support your learning in safety – the only school in Portugal to do so. Learn to sail from Start Yachting through to Yachtmaster Ocean aboard one of our superb privately owned yachts in glorious year-round conditions. Find out how much each course costs here. You can also check out our special offers at the top of the page. Great Sailing Weather in Portugal - come and join us! Next 5 day course availability from 29th April. Email for more details. SEE OUR AVAILABILITY PAGE FOR SAMPLE COURSE DATES. Many weeks are already in place but if you have specific dates in mind just contact us and we will do our best to make it happen. Email for more details. So, what gives us our edge? Our attention is entirely devoted to students particular needs with courses designed to fit students requirements rather than students fitting our calendar. We only use the highest possible grade of RYA instructors (including a resident Yachtmaster Examiner as our school principal). Their enthusiasm and abilities literally unrivalled. Our yachts are meticuloulsy maintained and equipped and are chosen specifically for their qualities, not their price. With a choice of styles to suit too whether you prefer crusing or more sports orientated sailing. Lagos, our base has the most consistent winds and weather of the whole of Iberia with more options available to us than any other training centre in Portugal. Whilst you may visit places like Albufeira, Vilamoura, Portimao and Faro we are 100% sure will enjoy being based at Lagos. Perhaps it’s the fact that all RYA sailing schools are able to teach up to 5 students per instructor whilst here at rusailing we choose to limit this to just 4* students on any standard course. This emphasises our student focussed approach and ensures you a superior level of tuition as well as increasing your comfort and learning potential - a massive benefit when learning to sail AND to help you enjoy the most of your break. Have a read of our testimonials below to see what our customers think or why not do your own research on the popular forums!? *Please note, numbers can be increased to 5 to accommodate families/group bookings if necessary. We also offer enhancements such as our ‘Optimum’ program where numbers are further limited to just three or even two in our 'Optimum Plus' courses. The choice really is yours. Our approach is both personal and professional and your enjoyment as well as learning are clearly very important to us. The Algarve provides us with an excellent training ground with many marinas and anchorages to visit whilst having year-round sailing conditions and realistic tides. There are challenging river entrances and easy through to complex pilotage exercises on hand, plenty of attractive anchorages and coastline views and masses of open water to get your sail trim just right. Whatever your current level and requirements we will do our very best to meet your needs and ensure that you leave us having built on what you already know and looking forward to your next sailing experience whether that is more training or a flotilla type holiday, charter or racing event . As well as sail training we can also offer yacht charter with or without tuition so why not incorporate a family holiday with improving your sailing skills as well as enjoying sailing off the beautiful Portuguese coast? Did a milage trip from Lagos, Portugal to Vigo, Spain with Rusailing and Richard as skipper. This was my third time with Rusailing, and first time with another skipper than Rob. Richard is also very good, experienced and taught me a lot. It was good sailing, even when the weather didn’t co-operate. I recommend Rusailing, and I know I’ll be back again! Mum, Dad and teenage son successfully completed our training with RUSailing over a week. Dad is now RYA Day Skipper and Mum and Son Competent Crew due to the excellent tuition provided by our friendly and professional instructor whose sense of humour and patience seemed limitless!! Aside from the great training, the whole experience was a delight. We were well taken care of and provided with a clean, very fully kitted out boat and generous provisions that satisfied even our always hungry son. One of the highlights for him was the home made soup Jules provided on day 5. The sailing was varied and we got a wonderful view of the gorgeous Algarve coast. A truly special learning experience for us all. I would recommend this sailing academy without hesitation…!! This is the place to learn and have fun. Rob is so enthusiastic and a joy to sail with – so much knowledge and experience. Excellent tuition without being intimidated in any way. We were on “Firefly “ a racy x-35 kept in Immaculate condition, fully equipped and very comfortable. The yacht was more than adequately provisioned with extra homemade treats from Jules. The sailing area offers something to everyone, I wouldn’t hesitate to recommend whether you are a beginner or more experienced. Both my daughter & myself had had a scary experience on flotilla sailing & hadn’t been on a boat for a few years. We both wanted to learn & more importantly see if we could feel safe, and enjoy being on a boat again… mission accomplished!!! Honestly I can’t imagine doing any more sailing courses with anyone else except with these guys. Hats off to Rob & Jules – awesome training school, brilliantly priced, helpful, informative… if you want to do any sailing courses, look no further!! Just completed and passed, the RYA “Coastal Skipper” practical course with RUsailing, and had to write a review to let anyone who is planning to do anything related to sailing, from an introduction through to yacht master ocean, this has to be the most professionally run sailing school you will find anywhere. The knowledge & experience of Rob as an instructor is exceptional, this promotes a feeling of totally safety in any situation, in any wind or sea state. Coupled with the style in which Rob teaches, it only adds to the experience, always at least two steps ahead of anything you or the boat is about to do, he is able to install confidence and ensure your learning is fun. You can be assured any and all the equipment you will use is maintained to the highest standards with no expense is spared. First, I want to say that I’ve never taken the time to write a review on TripAdvisor so hopefully that helps to reinforce how wonderful this experience was. My wife and I took the chance to learn a bit about sailing. We’ve never done any sailing but were keen to give it a go. We organized a 5 day competent crew course through Jules, who was extremely kind and helpful throughout the whole process. Paul “Muddy” Waters was our skipper/instructor. We can’t say enough about Paul. A genuinely wonderful character with a wealth of knowledge, a yearning to share it, and an ability to do it in a fun but serious manner. The boat was in excellent condition and we don’t have a single negative comment. The school of dolphins swimming with us on the last day was icing on the cake. Thanks for such a wonderful experience and we’ll see you next year for the Day Skipper course. As a couple we did a competent crew course on the Sailboat Annecy as a private chartered excursion off 5 days in March 2016. We were treated very nicely and got a perfect course adapted to our future goals. Rusailing listens very carefully to their customers and just make it happen. With our experience we can only recommend RUsailing, the communication prior to the event was quick and responsive what I could not say from other companies around offering the same packages. I thought returning to rusailing in Lagos to iron out some rusty sailing skills would be good. The week was in fact superb from start to finish. Lagos is a great sailing area and the yachts beautifully maintained. After 10 years experience in Lagos Rob is now a sailing instructor (and RYA Examiner) in a class of his own. He quietly instils confidence while both communicating the theory and ensuring you master some tricky sailing techniques. He even remained calm after a particular client accidentally triggered the inflation of an onboard lifejacket! The organisation and victualing backup from Jules is great, highly efficient and very personable. The focus of Rusailing is uncompromisingly on the customer, which makes it special. Regarding the feedback: I only have positive comments to make. The whole experience during the week matched my expectations, it was everything I hoped it would be. Your preparation and planning was, as usual, superb. Thanks again for the salad and cake you made for the trip. It is a pleasure to train with your school; the instructor’s expertise, knowledge and leadership is great. You both run a top notch operation! We spent several days on a trip from Lagos to Lisbon and back to watch the Volvo race start. Jules prepared everything impeccably for the trip, all arrangements were made for us to travel without a hitch. Rob is truly a master of his craft, handling the boat and coaching us with absolute ease – the X-35 is a beaut, especially coming into Cascais in 30kt winds! I fully recommend them for all RYA training and mileage building needs. Next is our coastal course in July…. Just completed my fourth 5 day training course with RUSailing. Another wonderful week. I’d like to concur with YachtAllan’s review and add that I am always amazed by Rob’s patience, each year I come the poor guy has to repeat so many of the lessons I should have remembered from the previous trip! Sorry Rob, I guess I’m just getting old! Every time we’ve been to The Algarve and sailed with RU Sailing, we’ve been lucky enough to sail with dolphins, a truly magical experience and this alone would be worth the trip! Add in the brilliantly provisioned boat (thanks Jules, just the right amount of everything! ), the well kitted out boats, the location, the local restaurants, the marina facilities, the weather!! Perfect! Just completed Day Skipper in what can only be called challenging conditions. The weather varied from windy to gales and sunshine so we had a complete range of conditions. Our instructor Gary was patient, knowledgeable and encouraging. The boat Annency was superb, well equipped and excellent as a sailing boat. Rob & Jules were thoughtful hosts and ensured we were well informed and catered for. The instruction was challenging educational and at the end of week we all felt ready to skipper our own boat. Through out all this the craic was mighty. I would fully recommend RUSailing as an educational establishment or a place for simply sailing fun and relaxation. If you like the water and messing about in boats you couldn’t do better. My course was in April 2015. I have sailed with these guys many times since finding them in 2009 and never fail to have a great time every time. The studying process was exactly as I expect it should be. Consistent and logical way of explanation, a lot of pratically useful details, patience, affability and at the same time informal way of communication. I would like to return to improve my skills soon. As for your question if I got from the week what I expected, well… actually I think you gave me a ‘problem’: Now all I want to do is Sailing! Thank you very much, it was fantastic. And Gary is really an amazing teacher. Wanted to let you know (and show off,) that the boat pictured is ours and have been sailing on it for the last 2 months thanks to your excellent tuition. I still have a lot to learn and experience of course….